If the joy of Christmas ever breaks through the frenzy of event-going and present-wrangling and (for me) end-of-semester grading, it happens through music. This year, for instance, I sat in my city’s gorgeous basilica and listened to a youth choir perform a haunting, dissonant arrangement of “O Come, O Come, Emmanuel.” The sound of the voices and organ in that space for a few transcendent moments nearly lifted me off the pew. No one can deny that the church’s writers and composers over the centuries have put their best efforts into music celebrating the Incarnation. Did you know, however, that there are Christmas hymns so bad they never get sung, even in the most desperate churches? Yes. I’ve done some research, and here are a few examples I discovered. Here’s one from about 1990. Good intentions involved, but you can imagine why it didn’t catch on. At least by the standards of his day. O tidings of comfort and joy, etc. Here’s another unfortunate attempt to be relevant. Admittedly, Luke 1 and 2 get all the love in Christmas music, so it does make sense to try doing something with Matthew 1. I guess. Abraham, he was old and gray but still became a dad. Isaac was the promised gift he thought he’d never have. And Judah begat Perez because Tamar, she was a crafty one. the line of Jesus, yo! until baby Jesus born in a manger came to kick some [censored]. So many carols remark on the cold, wintry weather in Judea that first Christmas night, which seems historically doubtful and probably only reflects European weather at Christmas. At least it used to. Evidently someone decided to write a new carol giving some attention to climate change. As temps climb more and more. For we have wrecked the earth. by this, your holy birth? 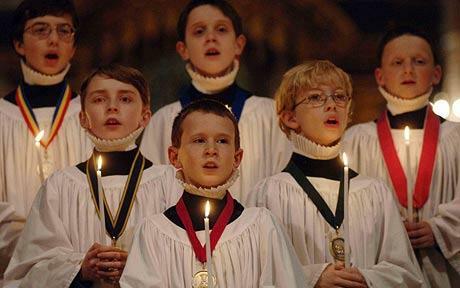 I’ve noticed that Christmas carols too frequently involve questions no one is asking. “What Child Is This?” No one is asking that. We all know. “What Can I Give Him?” Again, answer obvious: your heart. Duh. “Mary Did You Know?” I’m sorry, but this one is deeply awful. The speaker patronizes the Mother of Our Lord by taunting her with her lack of foreknowledge about things he only knows because he’s living 2000 years later. Honestly. Also, I’ve noticed that there are songs from the point of view of absolutely every character in the Christmas story. Mary composed her own song, of course, and we’ve been cranking out settings of it since the early church. You hear very little from Joseph, but I learned from my friend Greg Scheer that someone in England in the fifteenth century wrote a little song called the “Cherry Tree Carol” in which the pregnant Mary craves a cherry and asks Joseph to get one for her. He replies: “Why don’t you have the baby’s father get it for you?” Nice that Joseph gets one little passive-aggressive moment out of the whole situation. In the next verse, baby Jesus—still in the womb—asks the tree to bend over and deliver a cherry to his mom. Makes you wonder about family dynamics later on. Anyway, we’ve got “We Three Kings” from the point of view of the wisemen. The angels and shepherds get their jubilees. How about the innkeeper? Yep, someone has thought of that. The beasts? Surely you remember “Carol of the Friendly Beasts.” We even have a song from the point of view of a little boy who appears nowhere in the Gospel accounts but apparently showed up at the manger anyway—with his drum. What’s left? Well, we’re down to inanimate objects now. Maybe someone should compose a carol from the point of view of a rock on the side of the road to Bethlehem, a rock who asks questions no one needs answered. Then again, maybe not. Moving on. Don’t try this at your church. But I’ve heard a rumor that a certain over-eager music minister [no, I’m not revealing names here] wanted a super-awesome finale for his church’s big Christmas extravaganza. Nothing brings in the unchurched for a little Yuletide evangelism like an 80s pop hit lightly revised with Christmasy lyrics. So imagine a stable on the stage, dimly lit. Now here comes a few magi from the back of the auditorium, shakin’ it down the aisle, following a spotlight/star toward the stage. I have to admit, the lyrics transfer to a Christmas theme with surprisingly ease. Bang, bang, bang, on the door, baby etc. Love Shack Baby: that’s where it’s at. Merry Christmas!